What Does Code P0408 Mean? In the internal combustion engine, the ideal chemical reaction of combustion is as follows: oxygen (O2) + fuel (HC) = carbon dioxide (CO2) + water (H2O). Unfortunately, because engines are used over such a wide range of situations, ideal combustion often difficult to achieve. Outside of the lab, for example, there is a wide range of ambient temperature and humidity conditions, atmospheric pressure changes, as well as differing driver demands and even the state of the engine itself, all of which can lead to less-than-ideal combustion. Modern engines employ a number of strategies to achieve ideal combustion in ever-changing circumstances, using systems like variable valve timing and lift, variable ignition timing, direct fuel injection, and exhaust gas recirculation (EGR), to name a few. The EGR system is designed to reduce the production of nitrogen oxides (NOx), which are responsible for the formation of smog and acid rain (Nitric Acid – HNO3), amongst other environmental and health hazards. Under ideal conditions, nitrogen (N2) would normally not react with the oxygen during combustion, but abnormally-high combustion temperatures, typically over 2,400 °F, can enable N2 reactions and the formation of NOx. The EGR system injects a small amount of spent exhaust gases, routed from the exhaust pipe, back into the intake, reducing the amount of O2 available for combustion, therefore reducing combustion temperatures and the production of NOx. The EGR system connects the exhaust to the intake via pipes and a valve. The EGR valve used to be vacuum-modulated, but many vehicles have switched over to electronic control by the engine control module (ECM). Depending on demand, the ECM commands the EGR to open and close, controlling the flow of exhaust gas into the intake. The ECM also uses sensors to monitor system function, such as the EGR Temperature or Flow Sensor and EGR Position sensor. If the ECM detects a problem in the EGR position sensor circuit, it will set a diagnostic trouble code (DTC) and illuminate the malfunction indicator lamp (MIL). What are the common causes of code P0408 ? Depending on year, make, and model, DTC P0408 may have number of causes. Here are some of the most common. Sensor Fault – Because it is constantly subjected to heat from the exhaust, internal electrical faults are a common occurrence. Replace the sensor, clear the code, keep driving. Circuit Problem – Certain repair procedures may require disconnecting the EGR position sensor or interfering with its harness. Poor connections, poor routing, chafing, open and short circuits are par for the course. Repair as needed. Dodge / Chrysler / Jeep / RAM / MOPAR – A number of models in this lineup have released TSBs (technical service bulletins) addressing DTC P0405 / P0406 / P0407 / P0408. Reprogramming the ECM fixes the problem. Check with your dealership to see if your vehicle is covered by any of these TSBs. What are the symptoms of code P0408 ? Aside from the MIL, you will most likely not notice any drivability problems associated with this particular EGR DTC. Still, because the ECM is now running in “limp-home mode,” you may notice a slight drop in performance and fuel economy. How do you troubleshoot code P0408 ? Because this DTC describes a circuit problem, you’ll need a vehicle-specific EWD (electrical wiring diagram) and a DMM (digital multimeter) to diagnose it. General Check – Check the wire harness for obvious damage, such as from chafing or burns, which may cause circuit problems. Also, check for bent or broken pins, corrosion, or evidence of water entry. Repair as necessary and make sure connectors are properly seated. 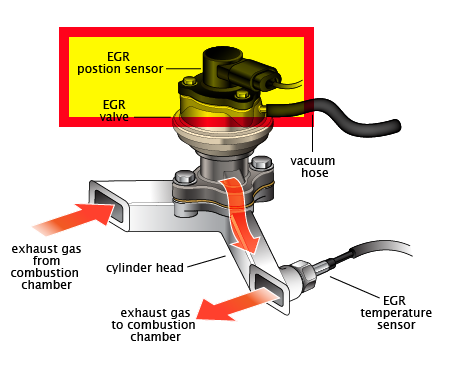 EGR Position Sensor Check – Most EGR position sensors are the three-pin type: reference voltage (Vref), Ground, and Signal. In the case of our Toyota EWD, these are VC, E2, and EGLS, respectively. If the EGR valve is vacuum-actuated, you can bench-test the position sensor with a DMM and vacuum-pump. Disconnect the connector and measure across the entire circuit (VC-E2), and you should measure something like 6 kΩ (6,000 Ω). On the signal wire, measuring between VC and EGLS, you should measure somewhere between 0.1 kΩ and 5.5 kΩ (100 Ω and 5,500 Ω), depending on how much vacuum you apply to the actuator port. If the EGR is electronically-actuated or you want to check output voltages, backprobe the connector with you DMM and measure voltage with KOEO (key on engine off). VC should measure somewhere between 4.5 V and 5.5 V and E2 should measure 0 V. ELGS should measure somewhere between 0.3 V and 4.2 V, which may vary, depending on the valve’s actual position. You can test voltage output of vacuum-operated valves by varying how much vacuum you apply with the hand pump. If you measure 5 V on E2, you most likely also measure 5 V on EGLS, which means you have an open circuit back to the ECM on the E2 ground circuit. Skip to Circuit Check to diagnose and repair. If you measure 5 V on VC and EGLS, but 0 V on E2, you may have an internal or external short circuit. Disconnect the sensor and check for resistance between VC and EGLS on the sensor itself. If you show less than 100 Ω, then you have a short circuited sensor. Replace it. If you show between 100 Ω and 5,500 Ω, you may have a short circuit in the wire harness. Skip to Circuit Check to verify and repair. If you measure 0 V on E2 and over 4.5 V on EGLS, then you have a fault in the sensor itself. Replace the sensor. Circuit Check – Disconnect the ECM and EGR position sensor and measure resistance on the three wires. Each wire, VC, EGLS, and E2, should measure 0 Ω end to end. Additionally, there should be no connection between any of the three wires or to ground. You should measure at least 10 kΩ between VC, EGLS, E2, and body ground. Repair as necessary. None found. Ask a question about P0408.